DAMASCUS: Russia and Syria have stalled access to Douma by international experts seeking to probe an alleged poison gas attack there, citing security concerns, a British diplomat said Monday. The claim came as the global chemical arms watchdog held emergency talks on the alleged atrocity, which prompted Western air strikes on Syria on Saturday. The head of the Organisation for the Prohibition of Chemical Weapons (OPCW), Ahmet Uzumcu, told the closed-door meeting his inspectors had failed to gain access to the site so far, the British ambassador to the Netherlands told reporters. Uzumcu said “the Syrian regime and the Russians were citing security concerns,” ambassador Peter Wilson told a press conference. The Russians and Syrians “have not been able to guarantee the security of the delegation to go to Douma at this point,” Wilson added, saying no timeline had been given for when they could visit. 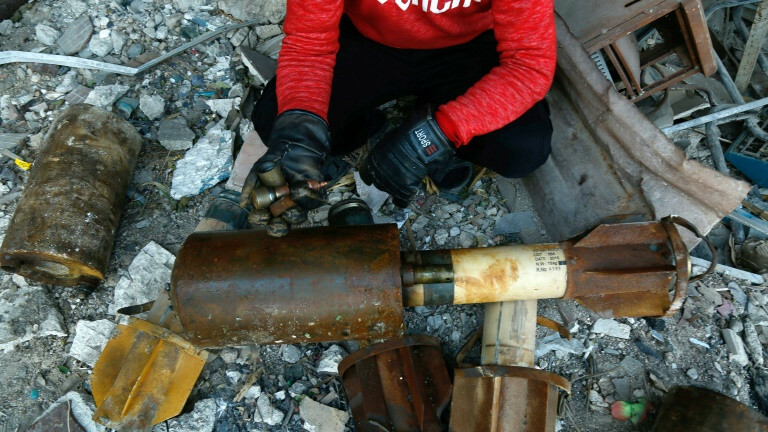 The talks at the OPCW’s headquarters come two days after a wave of punitive missile strikes in Syria launched by Western powers after the alleged April 7 toxic arms attack on Douma. The team had been expected to begin their field work on Sunday, but they met with officials at their Damascus hotel instead and a strict media blackout was imposed on their schedule. The Kremlin dismissed claims that Russia was impeding access. “We consider such accusations against Russia to be groundless,” President Vladimir Putin’s spokesman Dmitry Peskov said, adding that Moscow was in favour of “an impartial investigation”. The missiles that US, French and British warships fired on suspected chemical facilities Saturday constituted the biggest Western attack against the regime in the seven-year war.